This Pahari couplet is a perfect start for the story about the poet, Mohammad Saleem Beigh, who survived an attack in which he was caught. People were coming out from the Jamia Masjid after offering Friday prayers, and some gunmen opened fire on Sareer Ahmad Khan. While Khan and another person were killed in the attack on the spot, three others were injured. These included Beigh, then headmaster of the state-run High School at Chandoosa in Baramulla. 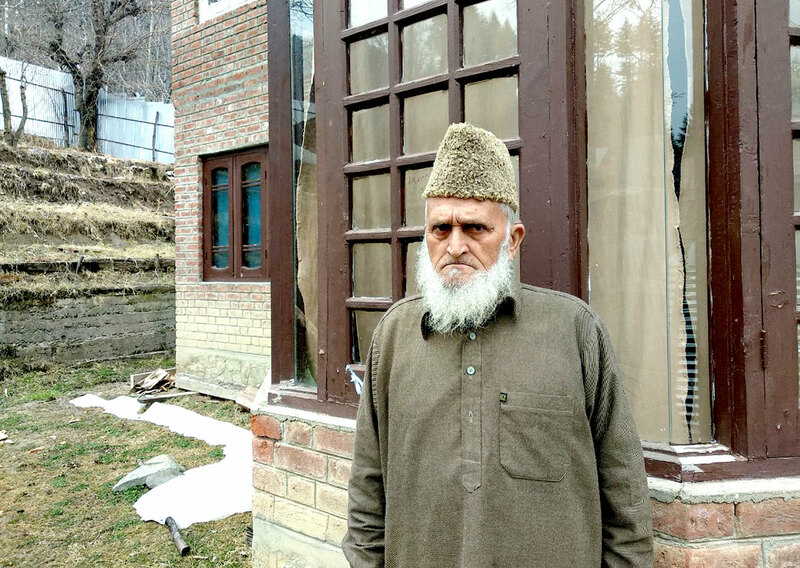 Beigh, now 75, was born and brought up in Baramulla’s Latifabad village. He writes poetry in Urdu, Pahari and in Persian. Besides, he is a writer, translator, a teacher and a social worker. Although a little of his work is published, his love and the writing skills in multiple languages makes him special. Born in a well-educated family, Beigh was sharp from his childhood. Youngest among four siblings, one sister and three brothers, his father Molvi Mohammad Ishaq Beigh was also a teacher. Beigh’s brother, late Mohammad Aslam Beigh was one of Baramulla’s renowned doctors. Beigh received his education from Government Nadim Memorial High School Bandipora and completed his graduation from Saint Joseph College Baramulla (now degree college Baramulla) in 1963. He did masters in Persian from University of Kashmir and honours in Urdu, English and in History from the Aligarh Muslim University. National Conference (NC) senior leader Mohammad Shafi Uri was his batch-mate when he was studying in Sopore. After finishing his studies, Beigh applied for Army services and cracked the officer level examination and emerged No 2 in the overall ranking. Well before he would join the armed forces, he got an appointment letter as a teacher. He preferred teaching to soldiering. “No doubt the position in the army was big, but the fact is that the love for books and thirst for learning switched my mind,” said Beigh. While he was teaching, he never gave up learning. In 1981, he did his second Masters in Political science from the University of Kashmir. Two years later, he completed Masters in Urdu Literature. Once back from his school, Beigh would get into his intellectual activities. He translated several books from different languages into Pahari and Urdu. But it is only part of his poetry that was published by the Sheraaza, a publication of the State Academy for Culture and Languages. Abu-Muhammad Muslih al-Din bin Abdallah Shirazi, better known by pen name Saadi Shirazi was well known Persian poet. Beigh translated Saadi’s famous books Gulistan-e-Saadi into Pahari and received several awards for that. Beigh is a regular participant of the programme of the cultural academy and Doordarshan. He is a frequent guest in cultural activities in schools. Off late, he is heading Pahari Welfare and Cultural Forum, the only organization for the upliftment of Pahari language and culture in the state. Being avid reader, Beigh has memorized almost 15000 poetic verses of great poets like Sir Mohammad Iqbal, Mirza Galib, Mir Taqi Mir, Main Mohammad Bhakhash and Saadi. He fluently speaks in English, Urdu, Persian, Pahari, Kashmiri, Punjabi and Gojri. He writes in four languages and understands Arabic, Dogri and Hindi languages as well. He is always in demand and people keep him busy on daily basis. Some even record his speeches and upload them on the social media. Most of his poetry is about Sufism and social issues. Post-retirement, Beigh is busy in preaching the faith and teaching the poor children. He is concerned over the corruption in faith.